Play a doubles match with the neighbors without paying a guest fee. 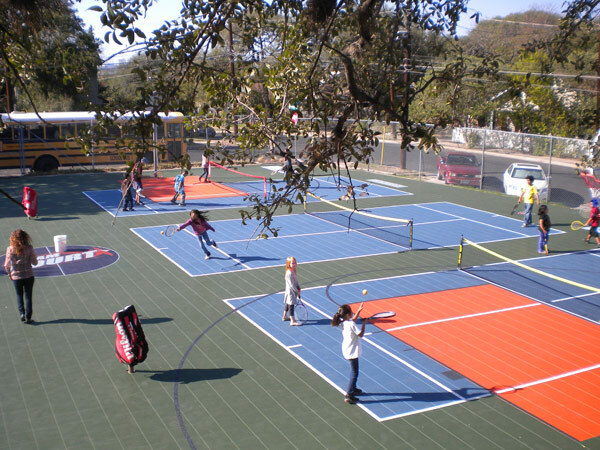 You can schedule it rain or shine because Sport Court® Houston can install a QuickStart Tennis court that is completely self-draining so it's dry soon after the clouds have emptied. Our surfacing also ensures your knees aren't drained as the Lateral Forgiveness™ surface springs you from side-to-side in every baseline rally. Contact us today for a free consultation or on-site estimate. No other modular surface surpasses the patented design of Sport Court®'s PowerGame for absorbing shock (based on ASTM F1292, which measures the likelihood of head injury as a result of a fall). Independent testing also confirms that our outdoor surfaces provide the highest level of traction and the lowest surface abrasion in the industry. Our athletic surface systems also feature our patented Lateral Forgiveness technology, which reduces stress on knees and ankles. Each of these features makes PowerGame the ideal surface for a QuickStart tennis court where new players will find a friendly and forgiving surface to help them develop their tennis skills.